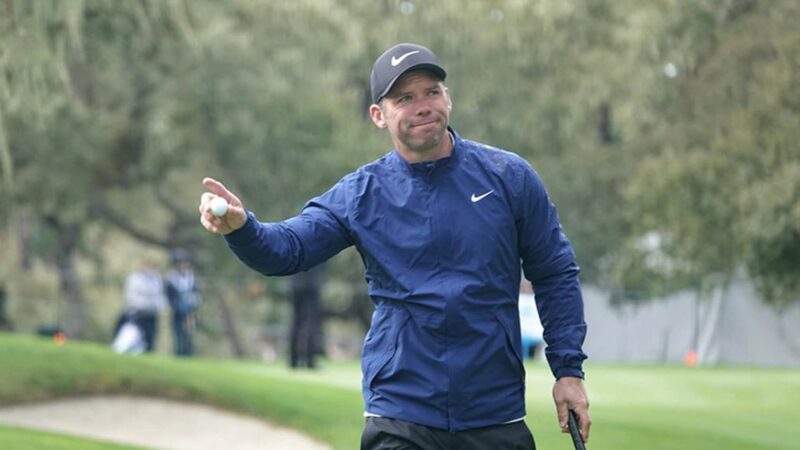 Paul Casey quietly put together another solid round Saturday for a 5-under 67 to give him a three-shot lead over Phil Mickelson going into the final day of the AT&T Pebble Beach Pro-Am. ‘I am having a blast,’ Casey said. Mickelson was part of the celebrity rotation at Pebble Beach and put on a show on the back nine, stuffing a wedge to 3 feet on No 13 and following with a 4-iron to 4 feet on the par-5 14th hole for eagle. He also made a tough save on the par-3 17th and shot a 2-under 70, giving him a good chance to match Mark O’Meara’s record of five AT&T Pebble Beach Pro-Am titles. Branden Grace dropped out of the top 10, down six places to share 14th, after a third round 71. The South African’s day got off to a slow start with just one front-side birdie; his four on the seventh offsetting three drops on his way out at Spyglass Hill. He managed to turn it around with an eagle 3 on the 11th and closed with two birdies, preceded with a drop on the 16th. A 73 saw Ernie Els drop 13 places to share 28th with one round to play.